Cebuano junior cyclist Luis Miguel "Igimax" Maximo, the youngest member of the Philippine Team, survived the gruelling and fast 115km Road Race of the 2012 Asian Junior Cycling Championships last Feb. 16, 2011 in Malaysia, finishing at 10th place in his age-group (1995), 18th place among the the ASEAN riders and 45th overall. The pace of the race was so fast and furious it resulted in five riders from Korea, Qatar, Singapore and Malaysia not being able to finish the race. 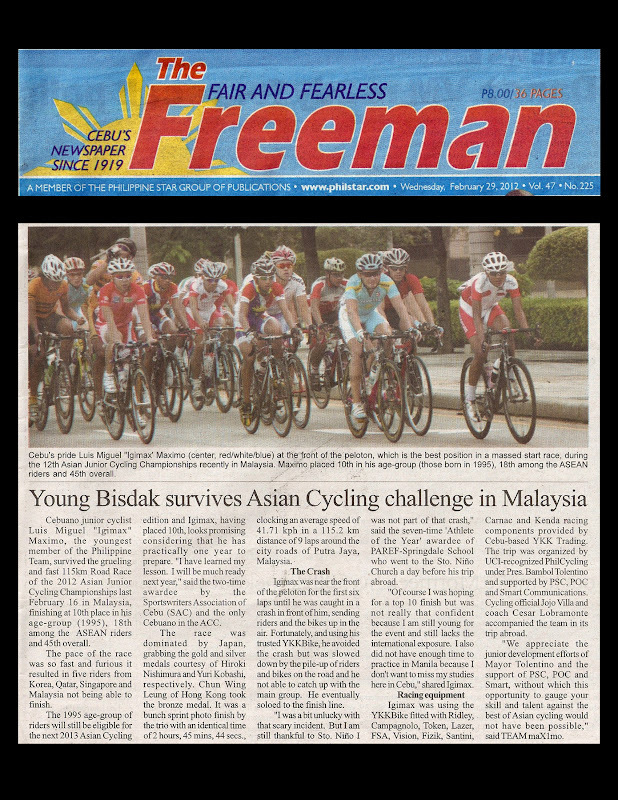 The 1995 age-group of riders will still be eligible for the next 2013 Asian Cycling edition and Igimax, having placed 10th, looks promising considering that he has practically one year to prepare. "I have learned my lesson. I will be much ready next year," said the two-time awardee by the Sportswriters Association of Cebu (SAC) and the only Cebuano in the ACC. The race was clearly dominated by Japan, grabbing the gold and silver medals courtesy of Hiroki Nishimura and Yuri Kobashi, respectively. Chun Wing Leung of Hong Kong took the bronze medal. It was a bunch sprint photo finish by the trio with an identical time of 2 hours 45 mins 44 secs., clocking an average speed of 41.71 kph in a 115.2 km distance of 9 laps around the city roads of Putra Jaya, Malaysia. Igimax was near the front of the peloton for the first six laps until he was caught in a crash in front of him, sending riders and the bikes up in the air. Fortunately, and using his trusted YKKBike, he avoided the crash but was slowed down by the pile-up of riders and bikes on the road and he not able to catch up with the main group. He eventually soloed to the finish line. "I was a bit unlucky with that scary incident. But I am still thankful to Sto. Nino I was not part of that crash," said the seven-time Athlete of the Year awardee of PAREF Springdale School who went to the Sto. Nino Church a day before his trip abroad. "Of course I was hoping for a top ten finish but was not really that confident because I am still young for the event and still lacks the international exposure. I also did not have enough time to practice in Manila because I dont want to miss my studies here in Cebu" shared Igimax. Igimax was using the YKKBike fitted with Ridley, Campagnolo, Token, Lazer, FSA, Vision, Fizik, Santini, Carnac and Kenda racing components provided by Cebu-based YKK Trading. The trip was organized by UCI-recognized PhilCycling under Pres. Bambol Tolentino and supported by PSC, POC and Smart Communications. Cycling official Jojo Villa and coach Cesar Lobramonte accompanied the team in its trip abroad. "We appreciate the Junior Development efforts of Mayor Tolentino and the support of PSC, POC and Smart, without which this opportunity to gauge your skill and talent against the best of Asian cycling would not have been possbile", said TEAM maX1mo.